Michael Keane, the deputy sheriff, is on the case again for this third mystery in Hidden Springs. He is a young single man who helps out in his local church with the youth group as well as looking out for his older aunt who raised him after the loss of his parents and other folks in town. He has an ongoing complicated relationship with a woman he has known from his childhood who is a lawyer in Washington, D.C. I have all three books in the series... I wrote a review for the second one and loved it so much I bought the first one to go with it. The third one is hitting shelves now. They can definitely be read as stand-alone books but I have enjoyed getting to know the people of Hidden Springs very much through the series. Gabhart jumps right to the murder in this one from the opening. It pulled me in right away and I have a hard time putting these books down because they are paced well and are written well. 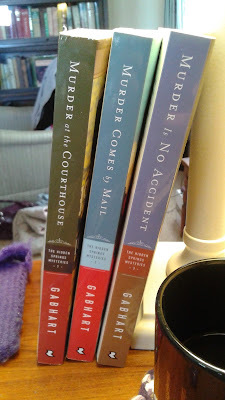 These books are kind of "Mitford" meets "Jesse Stone and Paradise" for me... I love both! Fifteen year old Maggie Greene assists her mother in cleaning the old Chandler place in Hidden Springs. The home belongs to a woman with dementia named Miss Fonda who currently resides in the local retirement care facility. On occasion Maggie sneaks in to spend time in the tower room to get away from the world and write, read or just gaze out the window. On this particular day she realizes that she is not alone in the house. She quietly waits and listens as she hears footsteps and voices. She did not want to be caught and be accused of breaking in and trespassing. In a matter of minutes she hears angry voices and then a commotion on the stairs. A woman shrieks and then there is a thump that shakes the upstairs. Maggie hears a door opening and closing. Once she emerged from hiding she saw the body of a local realtor Mrs. Geraldine Harper lying lifeless at the bottom of the top staircase. She knew she needed to get help but she could not let anyone know she was there. She looked around and took Mrs. Harper's phone and dialed 911.... the operator on the other end prompted Maggie to "respond if you can" and all Maggie could say was.... "She can't. She's dead." She hangs up the phone and then puts the phone down by Mrs. Harper's purse. Maggie makes her escape unseen... so she thinks. The body is discovered and the conclusion is made that it was an accident but Maggie knows better... will she come forward to tell Michael Keane or anyone else what she knows? 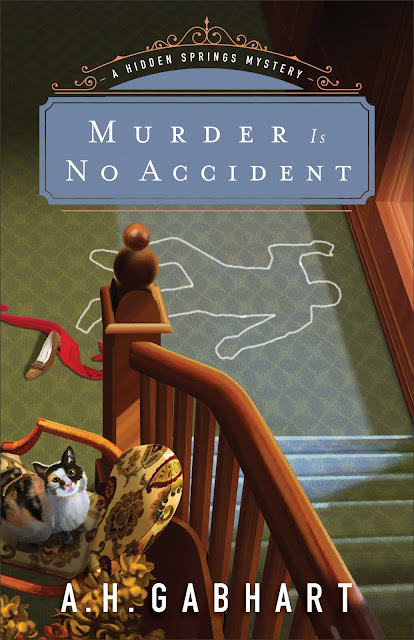 Join this cast of charming small town characters as they uncover surprises along the way to discovering if this really was an accidental death or if this is something more sinister. This book was provided to me free of charge from Revell (a division of Baker Publishing Group) in exchange for an honest read and review. Giving this one a 5 out of 5! Check out A. H. Gabhart's website for deals, freebies and upcoming book news.